I couldn't find an image that resembeled the USP (unique selling proposition), which is why I created a USP button on my own with clouds in the background. 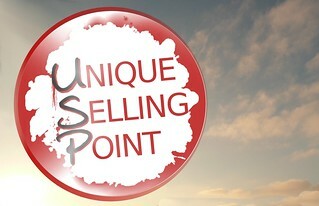 The Unique Selling Proposition (also Unique Selling Point or USP) is a marketing concept that was first proposed as a theory to explain a pattern among successful advertising campaigns of the early 1940s. It states that such campaigns made unique propositions to the customer and that this convinced them to switch brands. The term was invented by Rosser Reeves of Ted Bates & Company. Today the term is used in other fields or just casually to refer to any aspect of an object that differentiates it from similar objects. A number of businesses currently use USPs as a basis for their marketing campaigns.